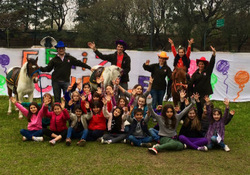 In Hipocampo seek to provide fun and innovative proposals for both children for parents, so they can enjoy a special day with their children. We offer a comprehensive organization that includes everything from the invitations to the food, drinks and games on horseback. ® 2008-2014 - Copyright Escuela de Equitación Hipocampo. All rights reserved.